I love New York for reasons like this. You couldn't pay me to actually use a pay phone. I'm scared to death of the sheer ickyness of them. Think of how many people over the years have touched them.... and I'd bet they've never been sanitized! But then in walks John Locke, a man who saw a fascinating opportunity in that bacterial jungle. And a great one at that. It's unclear to me how phone booths have even lasted to the year 2012. Especially now that everyone down to elementary school children have smart phones, so now these booths sit idol and vandalized. 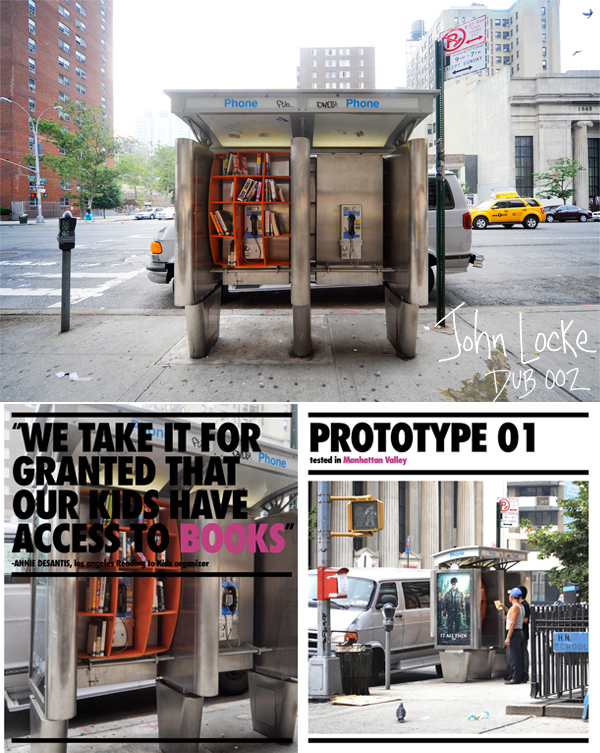 Architect John Locke saw these unused booths as a place to install a community library. After constructing the shelves out of plywood and fasteners, they were installed in a booth on the Upper West Side of Manhattan. The DUB 002 project is sponsored by his fictitious 'Department of Urban Betterment (DUB)' and it aims to bring together two nearly retired devices in the hopes of engaging the urban community. Without any signage being used to notify passing pedestrians of its use, it makes for quite an interesting experiment. Do you take the books? Are they real? Who do they belong too? I hope this prompts more people to create more projects like this one! "Even as they are rendered obsolete by the ubiquity of smartphones, I’m interested in pay phones because they are both anachronistic and quotidian. Relics, they’re dead technology perched on the edge of obsolescence, a skeuomorph hearkening back to a lost shared public space we might no longer have any use for. Something to be nostalgic for, in the way I can’t think about a phone booth without conjuring up images of an old, impatient woman banging on the door to one while I was inside using a calling card to ask for money. And of course they are nuisance, basically pedestrian level billboards that only blight certain neighborhoods (good luck finding a payphone in Tribeca, while there are eight separate phone kiosks on one block between 108th and 109th streets and Columbus Ave). But they can also be a place of opportunity, something to reprogram and somewhere to come together and share a good book with your neighbors."